Special to the Daily State Sen. Dan Gibbs and State House Rep. Christine Scanlan address the crowd at the Democrats' caucus Tuesday night. 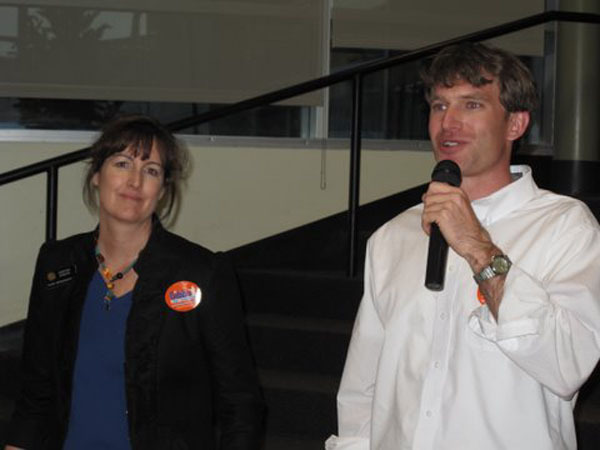 SUMMIT COUNTY – Local Democrats and Republicans officially kicked off the 2010 races Tuesday night and conducted straw polls – with results differing slightly from state averages. The Democrats here favored Andrew Romanoff for U.S. Senate while the Republicans cast the most votes for Jane Norton. The Republicans were most supportive of Scott McInnis for governor. Local representatives of both parties said they were pleased with the participation of 106 Democrats and 88 Republicans in a non-presidential election year. But Summit County Republicans vice chair Lisa Knobel said the “grassroots” event could be even more effective if more people registered with a party. She said it was evident by Tuesday’s results that people in both major political parties are dissatisfied with front-runners. Summit County’s active voters who participated in the 2008 election include 5,075 Democrats, 4,268 Republicans and 7,268 unaffiliated voters. Across Colorado, 21,693 Democrats and 25,341 Republicans participated in their local caucuses. The results were similar to those of Summit County, except that in the statewide tally Ken Buck edged out Jane Norton 37.9 percent to 37.7 percent. To date, no Democrat has stepped up to challenge Denver Mayor John Hickenlooper to take the seat of Gov. Bill Ritter. The selection of nominees is made at the Aug. 10 primaries, and caucus success in Colorado historically hasn’t always influenced the nominations several months later. “The Democrats are lucky to have two excellent candidates running for U.S. Senate,” she said. Knobel said the Republican caucus included many people involved with the Tea Party movement who helped to “engergize people and give focus” to the event.